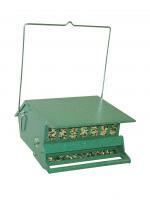 For customers who are sick and tired of watching squirrels ruin the bird-watching party, the Absolute II Squirrel-Proof Bird Feeder from Heritage Farms is the answer to your prayers. Taking a page from slapstick comedy, the Absolute II has a weight-sensitive perch that gives way when something heavier than a bird tries to eat the seeds, trapdoor-style! The perch weight sensitivity is even adjustable, so you can set it to trigger if unwanted larger birds try to break up the fun. Includes a pole and mounting hardware. Made from durable powder-coated steel. Holds up to 12 lbs. of seed! So far, successful. The critters have tried, but so far haven't been able to get to the seed. Thanks! Top quality design and materials. 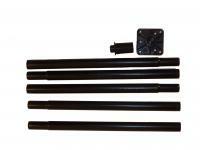 Having the package contain both the hang and pole options is a big plus. The package was delivered quickly to its destination (my son's home in Massachusetts) after previous feeders were destroyed by a 500 pound Bear. Thanks for great service. Very well made and I have the perch setting at medium. It took a few days for the birds to land on the two perches but now they are at home feeding and chirping away. A squirrel did attempt to climb the pole but slipped right off!! I still have squirrels because my husband feeds them peanuts but they stay away from the feeder! It's been a good month, so far so good! 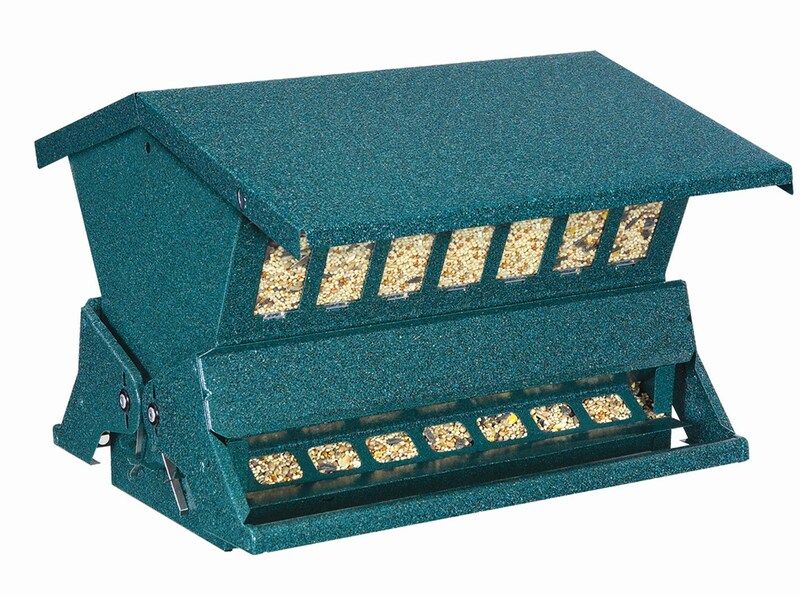 I was initially worried when reading other reviews that my Cardinals would not like this feeder. But my squirrel problem was such that the Cardinals could never eat from the other feeder (that they originally liked) so I decided to try this one and it is GREAT! It took a couple of weeks before they felt comfortable switching from the traditional wooden feeder I had to this one, but once they did, they are back in full. The squirrel tried for a few days to figure out how to get in and has now given up and gone to my neighbor's feeder. I was reluctant to spend so much, but I am already saving lots in bird seed because my squirrel problem is gone! I highly recommend this feeder. We love our new feeder. The Squirrels are not bothering it at all. Very happy with the quality. Enjoy your birds. This is absolutely the best squirrel proof feeder I have ever had. It actually works like a charm. CONGRATULATIONS on keeping the rotten little devils out of my expensive bird seed! Over the years I have tried many types of bird feeders that are supposed to be squirrel proof. Except for these feeders which are made from metal, all the rest I have had or seen are not designed and constructed very well. As squirrels are most determined critters, the ability to keep the squirrels off the feeder depends on where you hang it. Once they get to the feeder roof it takes them time to be able to figure out how to hold on and be able to get to the seed. In most cases, they are not successful and fall to the ground. But they will still keep trying. 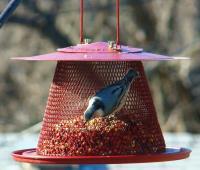 I have two of these feeders and will never have any other type as I am totally satisfied. They are designed and constructed well with a roof design that helps keep very heavy rain from getting to the exposed seed and even in rain the birds still come and eat. I used to always hang them in a tree but the squirrels could easily get to the metal roof and sometimes figure out how to hold on and stretch down to get to the seed without touching the movable metal bar. I now have constructed a galvanized 10 foot pole (used for metal fences) and mounted two long hanger arms opposite each side, generally used for hanging planters, and sunk a ground insert in the cement in which to slip the pole into (so it is removable for cutting the grass). When I do this, I cap the insert so dirt and water can't get into it. I hung each feeder on each hanger opposite one another. Before sliding the pole into the ground insert, I placed a round plastic baffle sold as a prevention against squirrels onto the pole. It fits tightly on the pole and squirrels are definitely no more. After years of trials, this combination works just perfectly. I love the double sided feeder which allows you to set different tensions on each side. I have larger birds feeding on one side while smaller ones can feed on the other! It is a great product! It is everything I had wanted and squirrel proof 100%. Only up 2 days, but so far so good. The crows can't remain on the bar and the squirrels can't access it. It looks beautiful in my garden. I found the instructions for assembly clear and easy to follow. A great product! We have been very happy with this feeder. We have gone through many types of feeders and this is one of the best as it keeps the moisture out and allows us to view birds feeding on both sides. Easy to clean and fast to fill. Its worked very well and is a a good value! The big fat squirrels used to think my yard was an all you can eat feeding station. No more, they must have found a new free lunch!! I love your product!! It really is squirrel-proof! My squirrels have given up and moved on! This is the best feeder I've ever had. Everyone that I gave them to thinks they're great and my son wants me to give their family one! So far the squirrels are baffled. Only one made it onto the feeder and left without a seed. The birds love it and are using it frequently. This is the 2nd feeder like this I've purchased. So that should tell you how much I liked it. The squirrel's can't figure this one out. It's great! The Backyard Chirper is working well! It's hard to outdo the squirrels, but this feeder really helps deter the little critters. Well built and easy to assemble. The feeder is squirrel proof but definitely NOT chipmunk proof - even set for the lightest birds. I purchased this feeder to replace a similar one I had that finally gave out. The pole isn't as tall which makes seeing the birds who do make it to the feeder from our window difficult. If chipmunks aren't your issue I would definitely recommend this feeder. Its been up for several weeks and do not get a lot of action for some reason. We even changed to a different food. I had seen this product first hand in a relative's yard and thereafter made my own purchase. It is as advertised! This feeder keeps out squirrels, holds a lot of feed, looks good and we are pleased with it. I love the huge amount of seed the feeder holds and that a group of small birds can fed at the same time while big starlings and grackles close it off when they try to feed. 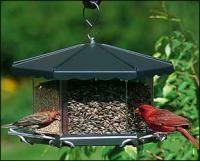 I have only one disappointment and that is the cardinal's I had in mind to watch when I bought the feeder don't use it. While the feeder will probably work as advertised, I was very disappointed in its condition when it arrived. The corners of the metal roof were bent down to where the sides of the roof were deformed. my star rating only because of the condition it was in when received. Once "adjusted", the feeder works quite well, and I would have given it 5 stars. Delaware squirrels must be more talented. They just climb up the pole & help themselves. I have 3 of these in our yard, and the squirrels here hold down the lever with one foot and eat the seeds.. I am very disappointed with this bird feeder. I am not even sure this feeder is keeping the squirrels out. My husband fills the feeder at night, by the afternoon almost all of the seed is on the ground! If it's not the squirrels, then the birds are dumping it out themselves. It looks like the "baffel" on the bottom needs to be bigger, because I noticed even when you fill it up seed comes flying out. there is a tension setting and if they touch the bar it will close the food off and will not let them get it. There is a tension level that can be low , medium or high.